1. Preheat your oven to 190C. 2. Thaw the pastry as per packet instructions. 3. Slice the pastry in half. 4. Spread 3-4 tbs of Nutella in a line in the centre of each piece of pastry. 5. 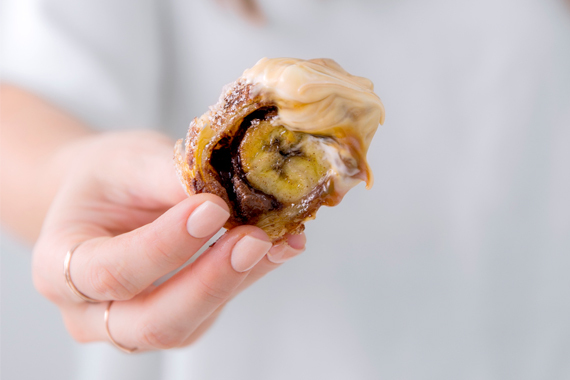 Place a banana on top of the Nutella on each piece of pastry. 6. Roll up and seal the pastry by gently pressing down where the pastry joins. 7. Slice the pastry rolls into 2-inch slices and place the slices onto a paper-lined baking tray. 8. Brush the slices with the whisked egg and sprinkle with cinnamon and sea salt. 9. Bake at 190C for 20 minutes. 10. Remove from the oven and set aside to cool for 20-30 minutes. 11. 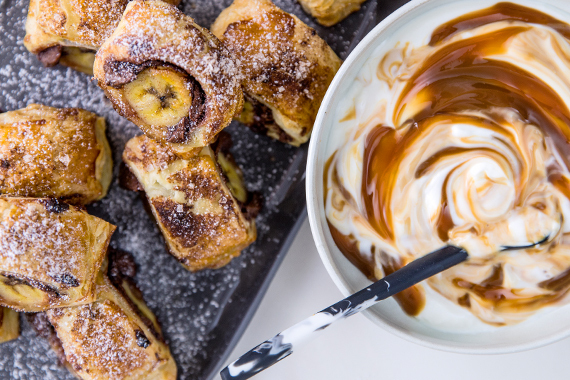 Serve dusted with icing sugar, or with yoghurt swirled with Nutella, or caramel for dipping.